There are a number of theme parks and amusement parks in Missouri and plenty of roller coasters and other rides to experience. Many, such as the wonderful Silver Dollar City are located in and near the state's entertainment capital, Branson. Other major parks include Worlds of Fun in Kansas City and Six Flags St. Louis (which, oddly, is located in Eureka). Let's run down the state's parks, both large and small. The parks are arranged in alphabetical order. Located on the strip in the heart of Branson, it's hard to miss the park's 200-foot-tall tower ride, Bigfoot Gravity Bomb. Riders in open-air seats slowly rise to the top and then freefall to the ground. On the other side of the tower is the even more thrilling Bigfoot Super Sling. Two passengers in saddle-like seats are catapulted up the tower and experience flips on the way down. Other attractions include an interactive play structure for younger kids with tunnels, slides, jumping platforms, and more called the Yeti Fun Zone, an arcade with redemption games, an 8D Cinema Ride, and the Bigfoot Discovery Expedition, which takes passengers on a guided tour in search of Sasquatch. Opened in 2016, the park features The Runaway Mountain Coaster. The ride is not a traditional roller coaster. Situated on Branson Mountain, the alpine coaster uses the natural terrain. Passengers control the speed by using onboard brakes. The park says that it has more attractions planned, but the alpine coaster is the only one open to date. Amusements at the family entertainment center include Tailpipe Alley go-karts, laser tag, mini-golf, and mini-bowling (which uses small balls and is designed for younger kids). As the name implies, Hydro Adventures also offers outdoor water park rides, including water slides, a wave pool, and a lazy river. The indoor family entertainment center includes electric go-karts, a small coaster, a Ferris wheel, an arcade, a maze, and a restaurant. The indoor and outdoor family entertainment center has a host of attractions, including bumper cars, a “Foam Factory” with cannons and blasters, laser tag, escape rooms, batting cages, an arcade, go-karts, and a climbing wall. Indoor and outdoor attractions at the family entertainment center include a small roller coaster, bumper cars, a Tilt-A-Whirl, a carousel, a Ferris wheel, a zipline, go-karts, bowling, laser tag, and an arcade. 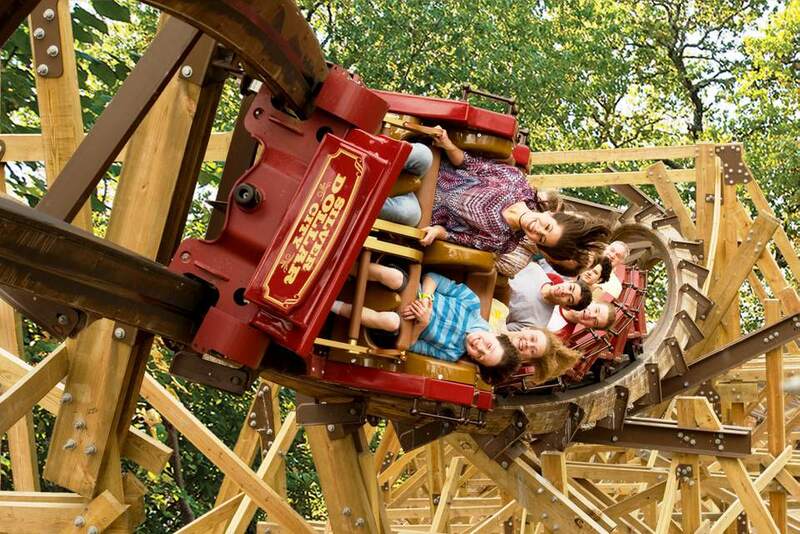 One of the country’s finest parks, the theme at Silver Dollar City is 1880s America. Thrill rides and coasters mix nicely with some great shows, music, and period crafts demonstrations. Among the standout rides are the incredible "controlled spin” coaster, Time Traveler, the industry's first wooden-steel hybrid coaster, Outlaw Run, and the launched coaster, Powder Keg. Food, which includes buffet-style and table-service restaurants, are one of Silver Dollar City’s highlights. Buckshot's Skillet Cookery serves scrumptious fare cooked in giant skillets. Homemade ice cream, candies, and baked goods are also among the treats. The park presents a series of festivals, including Bluegrass and BBQ, Harvest Festival, and one of the industry’s best holiday events, An Old Time Christmas. The major theme park, part of the Six Flags chain, includes plenty of coasters, including three wooden ones: American Thunder, Boss, and Screamin’ Eagle. It was one of two Six Flags parks to introduce the highly sophisticated, interactive dark ride, Justice League: Battle for Metropolis. The water park Hurricane Harbor, is included with admission. Consider purchasing the park’s skip-the-lines feature, Flash Pass. The major amusement park offers some great coasters, including Patriot, an inverted steel ride, Prowler, a wooden coaster, and Mamba, a 205-foot-tall hypercoaster that hits 75 mph. The adjacent Oceans of Fun water park is included with admission.